Dennis, Suzy and I went up to Falling Waters State Park Saturday to survey our campsite and the adjacent open field. First, our campsite will be #5. It is a pull through type for an RV and therefore is wide. Fortunately, it is also deep. I believe it is the best campsite in the park, We will pitch an 8-man tent there. Our Field Day category will be B, two operators, and one transmitter. The callsign will be N4Y. We will camp Friday and Saturday night. Our Field Day operations start at 1800 UTC Saturday and last for 24 hours. The back of the site borders an open field. We have permission to use it. However, we can't interfere with the volleyball court. We found looking out of the back of the campsite that the volleyball court is to the right, They have that area planted in grass. So to avoid that area there is an ample unplanted area to the left. We are seriously considering a 260-foot loop that is one wavelength at 80 meters. It can be a square or triangle. Let's assume it is a square with 65 feet on each side. We can align it with the compass points. 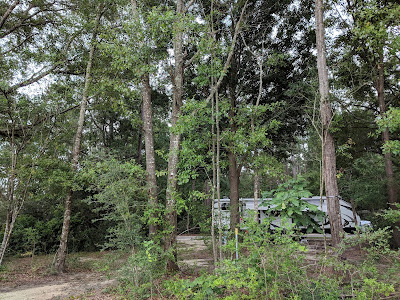 I believe feeding the loop in the Southeast corner is the practical choice to minimize feedline length to the campsite. I am hoping the feedline length will be no more than 100 feet. We will need to elevate it over a trail that runs along the back of the campsites. Modeling this loop with EZNEC I find that on 80 meters has maximum gain straight up ala NVIS. On 40 meters, it is omnidirectional but has the max gain at 60 degrees elevation. On 20-meters it has four lobes with a max gain of 10 dbi at 35 degrees elevation toward the Northwest. Unfortunately, there are nulls at the four compass points. You have to give up something to get gain. We might need a second antenna like a 20 meter vertical to fill in the gaps. The antenna supports could be four camo pole tripods 20 feet high on the corners with four 30-foot Jackite poles in between. I will need to round up a few more camo poles. I have a 2.5 to 1 balun that could be used at the feed point. An alternate feed would be 300-ohm balanced line to an Icom AH-4 tuner. The determination of the matching system will need to be a field test here in Panama City. We can see if this antenna acts as advertised. 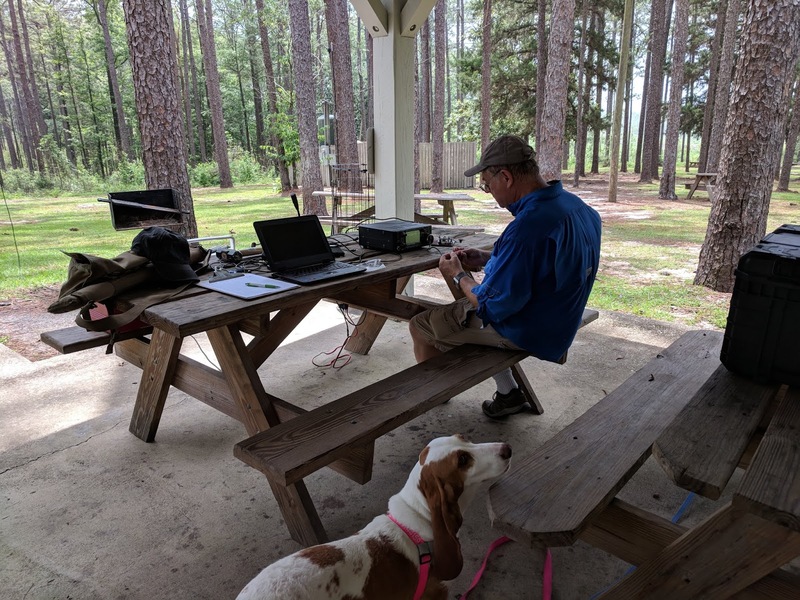 After the site survey, we set up the Icom 7300 at a pavilion. We played around with PSK-31 which is new to Dennis. We did not have it quite setup right on transmit, but we can work that out later. A heavy afternoon shower encouraged us to call it a day.